Formula One has long needed some type of cockpit protection and even drivers called for it, but the “halo” device F1 chose isn’t everyone’s favorite. Drivers reportedly voiced that in a press conference last week, but you wouldn’t know it if you watched online. Reports are that F1 edited the halo negativity out. Both entities keep doing that because not everyone is thrilled that come 2018, the cars will have a giant, funky-looking wishbone over the cockpit until a less ugly solution can be found. 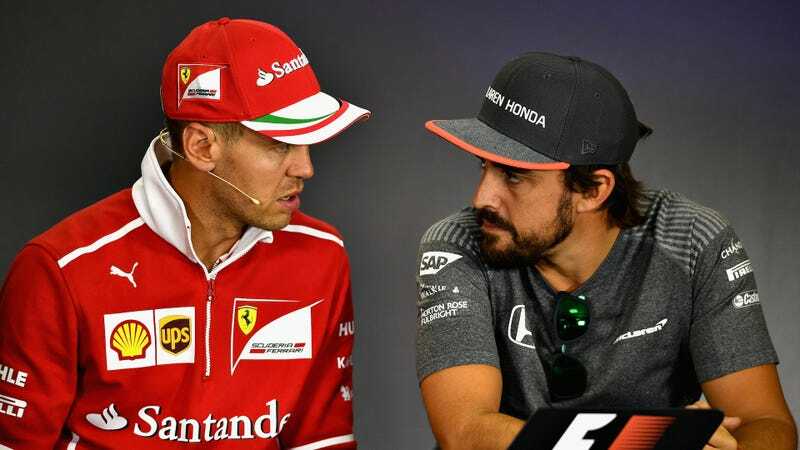 But it goes even further than constant positivity from F1 and the FIA—German newspaper Bild reported Saturday that in F1’s YouTube recap of the pre-race press conferences at the Hungarian Grand Prix over the weekend, the series edited out all of the negative comments from drivers about the halo. And while it’s understandable that F1 didn’t put the whole conference on YouTube, it is fishy that the only comments they left about the halo were the positive ones. Below is the edited video from the press conference. While we can’t say for sure when comments might have been edited out, the footage has random jumps to the crowd more than once. In video editing, that’s a common trick to mask an audio edit. In the comments under the video the fans are running storm against the censorship. The user “Beetjeklooien” asks: Why are all bad statements about the halo cut out? Over 800 fans rated the comment as positive. Formula One Management, which holds the commercial rights to F1, told Bild that the cuts were made as an “editorial decision.” The funny thing is, that term is for newsrooms—not for those in charge of public relations, like the folks who run the F1 YouTube account. Editorial decisions are also supposed to made for the greater good of a story, not for furthering an opinion in line with the people making those decisions. Jalopnik has reached out to F1 for comment, and will update if we hear back. Anyway, there you have it, everyone. The halo: It’s the greatest, best idea that F1 has ever had, and anyone who argues this is bad and terrible and wrong. Oh, wait. FOM doesn’t get to censor my blogs. Never mind on that last part.